There are many beautiful things in the world. I cannot make them all. I cannot be true to myself by copying others or by being influenced by so many that my self is lost. I must find my core, develop my art. I accept influence, process it and express it in my own way. Refusing to acknowledge what others do is to shut out the world, ignore advances and declare my own views better than any other. Accepting influence blindly, without reflecting on it and fitting it to my work is to deny my own views, to stifle my voice and shut myself out of the world. My bench was set up in a corner of the kitchen. I was using a small butane torch and pretty much all my tools are up there. The bench pin was new and whole (someday, I will share a recent picture of my benchpin). 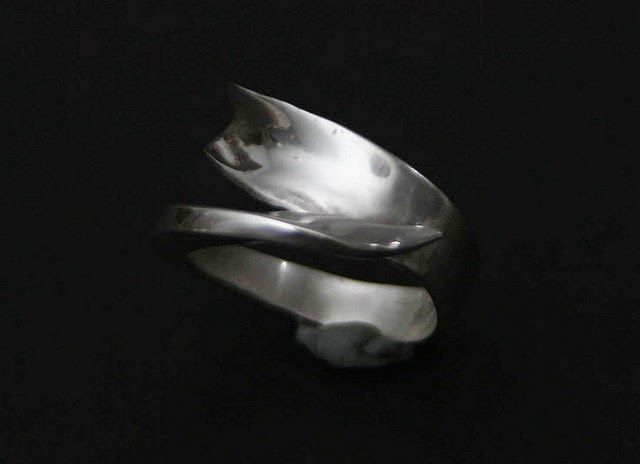 This was the first ring I ever made, forged sterling silver. Of course, tools are well known to breed and increase in size and quantity. They slowly took up the cabinet on the right (who needs a microwave anyway?) and the one on top. The dining room table was the perfect place (or the only place) to sketch, lay out stones and set up the computer. A corner of the living room was dedicated to the rolling mill and another to the lightbox. The reference materials, technical books and beautiful eye candy took up a chunk of my bedroom bookshelves. Not even the bathroom was jewelry free - it was the perfect place to run the tumbler, of course (running water, easy to clean up tiles and a door to isolate the noise). Can you say "house takeover"? Isn't that window just gorgeous? All the empty space, just for me. To top it off, there is a small bathroom on the opposite wall and a large closet on the other. But it is looking a bit sparse. Ooops, not after the movers brought all the stuff in! They were not happy with my solid hardwood bench and quite puzzled by the stump. I scavenged a table from the rest of the house and I was able to start working. There is even tea for me. 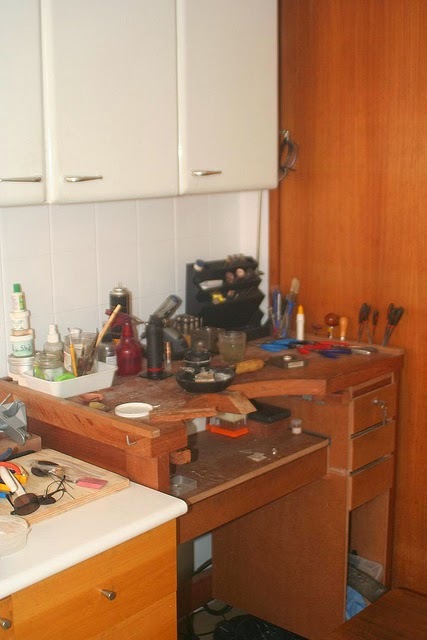 What does a metalsmith do with all that floor space still available? Add a 6 foot hardwood bench, of course. It holds my mill, soldering station, a standing work area and an area for odds and ends I am working on, stones I am planning to use and other random things. And this is my studio at the moment. Of course, it is liable to change at any moment (I do need a proper desk) but it is a wonderful working space, where I can have all my tools, space to work in and light. That was quite a journey.